Want to add aromatherapy to your massage menu? Not sure where to begin? Listed below are just of few of the oils that we carry along with benefits and uses for each one. If you are still confused, call us. We will be happy to guide you to a great starting point! 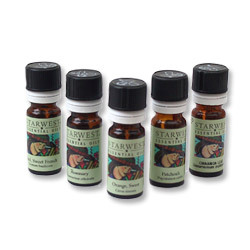 We carry over 64 different scents of Starwest Essential Oils, from the 1/3oz to 4oz size. These pure essential oils come in single notes and great blends. What ever scent you need, we either have it, or will get it for you! You can use essential oils in Diffusers or in your massage lotion, oil, or creme, or even in a bathtub. Click on each for a brief descriptions of its uses. 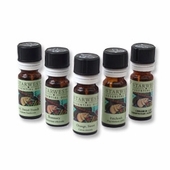 Also, check out the Starwest Essential Oil Blends and the Leyden House Essential Oil Blends.